Dorking United Reformed Church. Uniformed Church Groups. 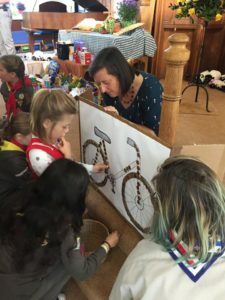 Scouts and Guides at Dorking United Reformed Church. Beaver Scout Colony – for boys and girls aged 6 to 8, meets during the school term at 5.30 pm in the Follett Hall. Cub Scout Pack – for boys and girls aged 8 to 11, meets during the school term at 6.45 pm in the Follett Hall. Guide Company – for girls aged 10 to 14, meets during the school term at 7.00 pm in the Main Hall. Brownie Guides – for girls aged 7 to 11, meets during the school term at 5.15 pm in the Follett Hall. Scout Troop – for boys and girls aged 10 to 14; meets during the school term at 7.30 pm in the Main Hall.